The “LG” is the ideal small guitar. If you are familiar with Martin and Taylor guitars, this model falls somewhere between the Martin 00 and the Taylor GC in size. The neck is attached at the 14th fret on this 25.5″ scale beauty. (Many custom commissions have requested a 24.9″ scale, which is very possible.) Designed for the finger-style player, this guitar still has the head room to do a lot of strumming. 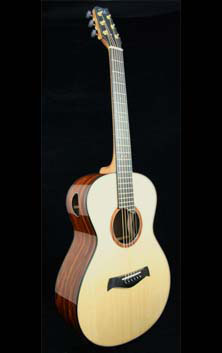 Available in cutaway or non-cutaway models.